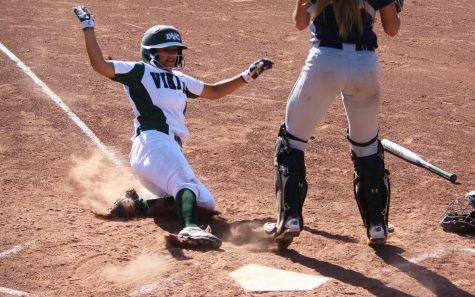 Diablo Valley College softball's narrow 2-1 victory over American River College on Tuesday in Pleasant Hill was highlighted by the performances put up by a couple of sophomores, pitcher Sita Manoa and catcher Elvia Alvarado. It might have been their last home game in a Vikings uniform, but the pitcher-catcher duo made sure to leave it all on the field. The two did just that. Manoa did it all for the Vikings. She pitched a complete game, gave up one unearned run and struck out seven ARC batters. On top of a stellar pitching performance, Manoa also went 2-for-3 at the plate, scoring a run on her leadoff single in the fourth inning to tie the game 1-1. Off all the four hits DVC mustered that afternoon, the Vikings' pitcher had half of them. Manoa admitted after the game pitching in such a tight, low-scoring game was "a little nerve-racking." However, Manoa pulled back from her comments by adding, pitching behind a great defense shot down any extra pressure for her to pitch perfectly. The plays Alvarado made behind the dish exemplified exactly that. One of the plays had Alvarado make a diving play to tag the ARC runner out attempting to score from third on a wild pitch, ending the top of the fourth inning. "It was coming back really fast and I knew I was close to the plate and I knew I wasn't gonna beat her there by (foot)," said Alvarado. "She's a pretty fast runner, so I just dove, stuck my glove out there." Alvarado saved a pivotal ARC run from scoring. The play was huge for the Vikings because they were already down 1-0 in the top of the fourth and unable to muster any offense against ARC starting pitcher Samantha Whitworth. Subsequently, DVC tied the game 1-1 in the bottom half of that inning thanks to the aforementioned single by Manoa. After the Vikings took a 2-1 lead in the sixth thanks to a Kathryn Cassin sacrifice fly that scored Mariah Schuchart, Alvarado made another huge play for the Vikings in the top of the seventh. Alvarado threw a strike to Nikki Mason and caught an ARC runner trying to steal third base for the first out of the inning. "It really just took all the pressure off and that just made the game that much easier," said Manoa who gave up that leadoff baserunner in the seventh. "That being our first out was a total game-changer." According to DVC head coach Dennis Luquet, only two runners have successfully stolen a base when Alvarado is behind the dish. "She's got a tremendous throwing arm, hell of a competitor," said Luquet. "That's why she came up with the big plays when you need it." With the win, the Vikings will head into postseason play starting next week. Their next opponent and venue of the game are unknown as playoff teams' seedings are not yet finalized.